A wave of new microbreweries is changing the way people drink beer in Ho Chi Minh City. It was a tough writing assignment but somebody had to do it. Singapore Airlines asked me recently to write an article for the online edition of their in-flight magazine about the recent explosion in popularity of craft beer breweries in Ho Chi Minh City (a.k.a. Saigon). 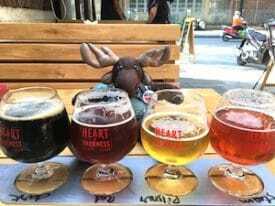 Globejotting travel mascot Sven Wondermoose was an official taste-tester for this article. In a land that until recently offered few alternatives to generic lagers, craft brewing has suddenly surged in popularity Vietnam. In the last six months alone, four of the six breweries profiled in my article have just opened. Pasteur Street Brewing Company ignited Saigon’s microbrew passion when they opened a couple of years ago. A few of their beers are now available in bars throughout Vietnam, but for their full range, you must visit their taproom. The award for Saigon’s cutest beer logo goes to Winking Seal Brewery. Heart of Darkness caught my attention as a writer because the bar is themed and each beer is named after a line from the Joseph Conrad novel of the same name. They offer a diverse spectrum of beer varieties in their cozy pub and outdoor garden. East-West Brewing boasts a larger beer hall than the above, cozy establishments. The giant tanks leave no question you are sitting in a brewery as you sample their options. 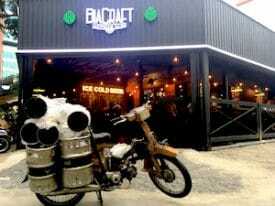 Kegs arrive by motorbike at BiaCraft’s District 3 location. BiaCraft has two locations in Ho Chi Minh City. In addition to offering their own beers on tap, they also have a selection of beers from other craft brewers around town. Lac Brewing is located in Phu My Hung, an expat neighborhood in District 7, about 25 minutes from downtown Saigon. A cheap taxi or xe om (motorbike taxi) ride brings you to their tasting room, with several taps to choose from. Vespa Adventures have just launched a new Vespa craft beer tour. You get your own, private Vespa chauffeur as you visit several of the above craft beer pubs. if you’re too terrified to hop on a motorbike in Saigon’s crazy traffic, Canadian Jason Kerchawy will soon be launching beer tours on foot. He says details will be available soon from Heart of Darkness. 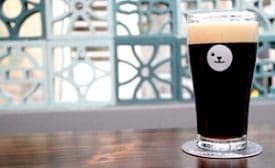 There’s another brewery that didn’t make my article because they’re not in Ho Chi Minh City, but if you’re heading north to Hanoi, be sure to check out Furbrew. I spent a month in the Vietnamese capital a few months ago, and Furbrew became my regular evening hangout. In addition to some great mainstream beers, they also had some more experimental brews on tap including one based on cà phê đá, Vietnam’s devilishly tasty iced coffee, and another inspired by the herbs and spices in the country’s iconic rice-noodle soup, phở. You’ll find my full article about Craft Beers in Saigon with more details on all of the above Saigon brewpbs at SilverKris.com, the inflight magazine for Singapore Airlines.